group bookings is only non refundable bookings. Cheers Vintage is waiting for you to bring you the best of Istanbul and Turkey. Our events and tips can help connect you to the lesser-known corners of Istanbul while meeting with like-minded travelers from around the world. 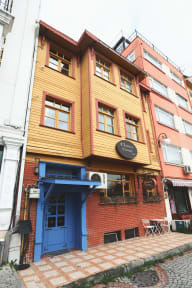 Cheers Vintage is located in Istanbul's famous old town, 3-4 minutes walking distance to magnificent Hagia Sophia, Blue Mosque and minutes by trams from everything you want to see and you want to do in Istanbul´s vibrant neighborhoods. Dolmabahce Palace is 4 km from the property, and Yildiz-Park is 5.6 km from the property. Ataturk European Side Airport is 14.5 km away. Free Wi-Fi is available throughout the property. The property offers terrace and views of the sea, also guests can enjoy a meal at the restaurant. There is a 24-hour front desk at the property. Just a few steps from Aya Sofia but on a quiet side street (mid April). This atmospheric small place is definitely worth to stay. 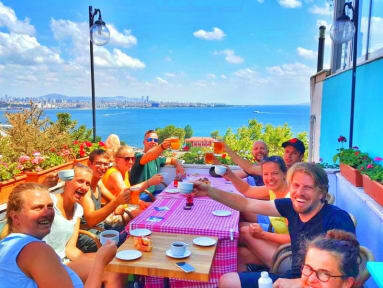 Reasonable price, friendly staff ( happy birthday Alex :) , even a small but fresh breakfast with the view on the Bosphorus. At the evening you can enjoy a beer on the tiny terrace or just seat in front of the building looking at the neibourhoods dogs and cats passing by. My time at cheers vintage was an absolute dream. I was so pleased to stay in this hostel. The decor is charming and has a very homey feeling. Visiting with other travelers from around the world in the terrace and or rooftop bar was one of my greatest experiences. The staff are a delight to speak to and to be around and quickly they become like your family. Having an answer to any and every question I had. I really loved the location of this place as there was sooo much to see and do. Love this place! Actually ended up coming back here for the second half of our trip. The staff is great. The bathrooms are wonderful. Everyone is so nice and the location could not be better! Great place!!! Awesome hostel with great staff, a bar and in a very central location. Beds were comfortable and the room clean! Had a great time at the events they organised and met many People...Also boss order me two beer for free thanks a lot boss 👋 Would highly recommend this place! Great location. The breakfast/evening bar has a great view. Seagulls like to come by for crumbs, but they also woke me up on my first night! Friendliness and helpfulness of staff is exceptional. Street is very narrow and not all taxis or tour group drivers want to navigate it. Great place to stay if you enjoy walking to scenic attractions. For my first 2 days, I was able to walk to 6 different attractions on my list. Very low price for a private room, but private rooms are not always available. Super friendly staff, amazing location, good breakfast. 8 ppl dorm is dark and stinky but the staff happily changed me to another room which was really good. Bar upstairs a bit too loud. My friend and I arrived very late and night and Alex was there to greet us and help us into our room. All of the staff are very kind. I would recommend this to anyone looking to see all of the major sights in Istanbul. It’s right next to the Blue Mosque and Hagia Sophia. Breakfast was light—vegetables, bread and cheese. The hostel should enforce quiet hours though as some blared music late at night. I went during low season and only stayed one evening before a flight the next day. I liked my room but there was only one light for it. When you shower water gets all over the room which is quite annoying. Staff were nice. Atmosphere was pretty dead because the hostel was pretty empty. Surely better in summer.